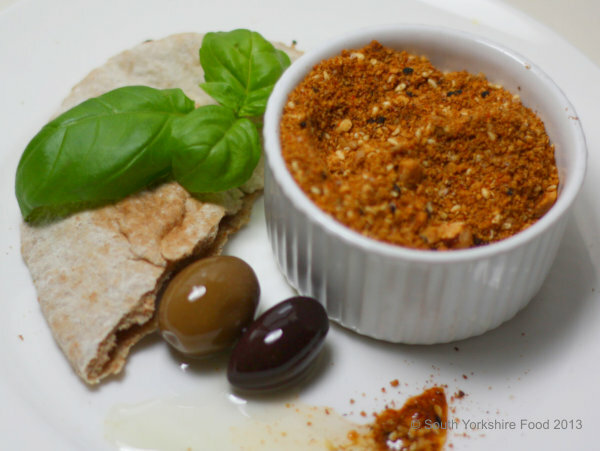 Dukkah (pronounced Doo-kah) is an Egyptian toasted nut and spice mix that found popularity in Australian cooking. It is so versatile and tasty that it can now be found all over the world. Most commonly hazelnuts are used in the spice mix, but cashews, pistachio and almond are also used along with dried herbs such as mint, oregano and thyme. The combinations are endless. This is a basic recipe that you can use as a starter for your own combinations. Try it with warm flat bread dipped in good olive oil and then dipped in the dukkah, sprinkled over hummus, salads,and roasted vegetables, or on meats as a baking or grilling coating. Rub the hazelnuts between a clean tea towel to remove as much skin as possible. Heat a medium frying pan over medium heat. Add the sunflower seeds and toast until golden. Put them in a separate bowl to cool. Finally, add the sesame and nigella seeds, stirring, for 1-2 minutes until the sesame seeds are golden. Add to the bowl with the hazelnuts. Place the pepper, sunflower seeds, coriander seeds and cumin seeds in a pestle and mortar, or spice grinder, and grind quite finely. Add the crushed spices, paprika and salt to the hazelnut mixture and mix well. The dukkah will keep in an airtight container for about a month.